It's been a mesmerizing month for 11-year-old, Golconda, Illinois native Mason Ramsey, whose star rose dramatically after footage of him yodeling in a Walmart became the internet's favorite meme. 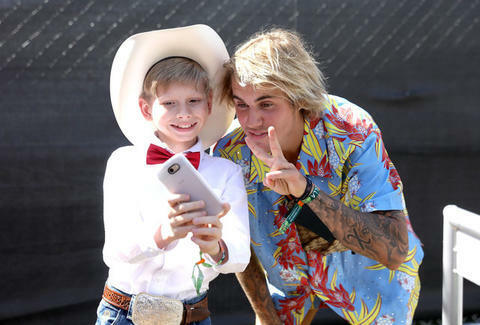 Since then, the young man has taken selfies with Justin Bieber at Coachella, earned praise from the world's biggest DJs, and enjoyed a tete-a-tete with Ellen Degeneres, all while proudly sporting his new name: The Walmart Yodeling Boy. Now, in the world's most predictable news, Ramsey is primed to release his debut single, which contrary to the internet's expectations will not feature any yodeling. Stereogum reports that Ramsey has signed with major labels Atlantic and Big Loud. His debut single, called "Famous," is an obvious commentary on his whirlwind experience as a viral internet star, and one that is ostensibly designed to sell records as a pop-country hit. It sounds more like Garth Brooks than his rendition of Hank Williams' "Lovesick Blues," which he performed at Walmart and then later at Coachella. In the song, Ramsey notes that it's "pretty cool to be on TV," but he'd rather owe his fame to being a kind and compassionate partner in a pre-teen relationship. He sings, ostensibly to another 11-year-old, that he'd rather be "famous for loving you."